“The Stumpster” marks a throwback to an earlier Stump’s model of smoker that has been redesigned and reintroduced with improved features. Its Variable Burn Pattern(VBP) charcoal system enables long and consistent burn times and even temperatures without the need for monitoring this smoker during the cooking process. 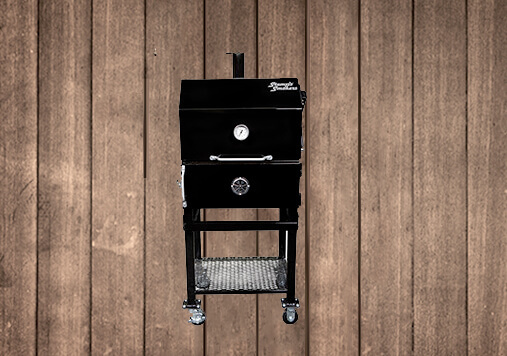 For the cook who wants most of the features Stump’s has become known for, this unit was developed for the budget minded with the same quality that’s built into every Stump’s Smoker. Another important feature is the small footprint incorporated in this cooker, it allows for less weight for ease of movement and less space required in today’s smaller spaced world. What is a Variable Burn Pattern Smoker? A Variable Burn Pattern Smoker uses direct heat contained within a charcoal rack; meaning the fire or heat source is directly under the cook chamber. Natural air movement and gravitational draw is used to move the heated air thru and across the cook chamber and out the stack. How does a Variable Burn Pattern Smoker work? 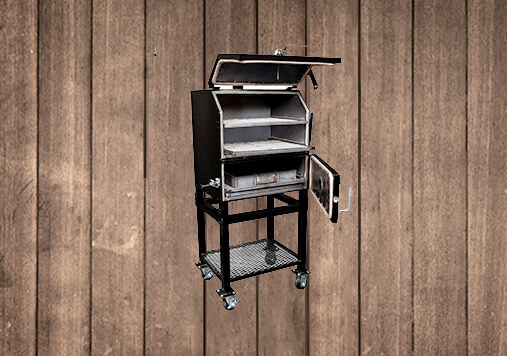 The Variable Burn Pattern Smokers utilizes a rack with a “U” pattern underneath the removable diverter to heat the smoker. This means the amount of “fire” is controlled by the amount of oxygen that is allowed in through the front butterfly vents. Without the butterfly vents open, the fuel can’t fully ignite because there isn’t sufficient oxygen in the heat chamber. So the burning area of fuel is contained in the VBP rack. where there are slotted vents in the front and back of the cook chamber that allow the heat/smoke to transfer upward from the VBP into the cook chamber. Once inside the cook chamber, the divider plate evenly distributes the air and heat and allows the natural convection process to begin. Once this process has started air and heat movement naturally drafts up in a convected motion around the smoker and out through the exhaust stack. So by controlling the amount of oxygen that is fed in, we can control the amount of “fire” or the temp in the cook chamber. The heat/smoke moves through the cook chamber of a variable burn pattern much slower than in a typical offset stick burner smoker. Therefore the cook chamber doesn’t dry out as much either — this creates a nice moist cooking environment that doesn’t tend to cause meat to dry out as fast while it is cooking. What is the best way to start a fire in a VBP Smoker? After properly arranging the VBP rack; The Diamond Match Co. makes a product called Strike-a-Fire that can be used. Remove one of the big matches from the package and light on the side of the box allowing the flame on the end to become the size of a large lemon, open the charcoal chute door and drop into a small clearing in the beginning of the VBP rack. Check to see that there still active fire on the match. Open the air vents to approximately 1/3 of the way open and close the fire box door. Adjust the rain cap to about a 1/3 of the gap. After a notable fire is started, open the vents and let come up to desired temp with the adjustment of the vent handle. The second method, using a lit Plumber’s Torch, stick the nozzle through the VBP rack and allow the torch to light several pieces of charcoal. Once the charcoal is lit, shutdown the torch and close the fire box door, the rain cap should also be at about a 1/3 of the gap. Open the vents with the handle and let come up to desired temp with the adjustment of the vents. How do I season my Smoker? After completing the process of starting a fire, bring the Smoker up to temperature by adjusting the ball valve. The desire temperature for seasoning in a Smoker is 250 to 300 degrees. After allowing the smoker to cook at the set temp for one hour, open the door and (using a spray bottle filled with vegetable oil) spray the inside with oil coating all surfaces on the inside EXCEPT the gasket. Close the door and allow the smoker to cook for 3 hours at the set temperature. At the end of 3 hours, close the ball valve and allow the Smoker to begin shutting down. Allow the Smoker to reach an internal temperature below 150 degrees, open the Smoker and repeat the process of spraying the insides of the smoker. Once this is accomplished you can restart the smoker and begin cooking. How do I clean my VBP smoker? Cleaning a VBP Smoker is very simple and straightforward. No water should ever be used unless you have a grease fire. Care for the inside of your Smoker just as you would your cast iron skillet. After using the Smoker bring the smoker up to 300 degrees and let it cook for about an hour. After shutting it down take a heat tempered brush and wipe the racks off of debris. Before you use your smoker always clean the VBP rack and empty out the ash pan. The simplest way to clean the cook chamber is to wipe off the interior of the smoke chamber with paper towels, empty and clean out the grease pan the diverter and the bottom with a heat tempered brush. Then just take a fireplace shovel and remove all the debris from the bottom of the smoker. Wipe any excess carbon off the bottom and you are ready to go. Why is the smoker not keeping a constant temp? Learning to properly stack and arrange the charcoal in your VBP Smoker will greatly decrease the inconsistent temps in your cooker. We have found that starting off the arrangement of briquettes or lump has a definite advantage verses random arrangement in the temperature consistency of the unit. We advise that laying it out in a coarse brick pattern will work best. As you move thru the pattern tapering the number of charcoal in the stack from start to finish will help also decrease the temperature rise as the cooker burns thru the pattern. What temps are best used for smoking? 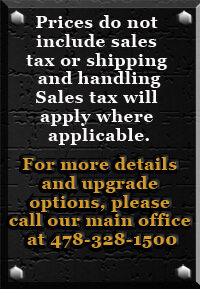 The best temperature to run your smoker at is in the range of 205-325 degrees. Most who smoke use the temperature range of 225-250. Once you have mastered your Variable Burn Pattern Smoker; Using higher temps to facilitate faster cooks of beef, seafood or fish at a higher temperature is not a problem for your Smoker. * One Note* The flashpoint of animal fat is 350 degrees. Always remember to thoroughly clean your smoker before cooking at higher temperatures. Can I add flavor woods to my Variable Burn Pattern Smoker? Wood selection is a matter of the Cook’s palette. Therefore, we have included some basic guidelines for selection. A wood that is going to be used should be either fruit or nut bearing. The most prevalent smoking woods include oak, hickory, pecan, peach, apple, cherry, and mesquite. The fruit woods produce a mild flavor with a slightly sweet finish. The oaks and other hardwoods produce a heartier smoke flavor and pecan can influence some meats with a hint of sweet. Flavor wood will also influence the color of the meat. Some Pitmasters like to mix cherry and pecan which produces a cherry like color on the bark and a slight sweet smoke flavor. One other consideration when selecting wood is seasoned vs. green; most Pitmasters choose seasoned wood. Seasoned wood burns more predictably, which contributes to a cleaner burning fire and minimizes temperature spikes making pit management easier.